Kolkata Knight Riders owner Shah Rukh Khan greets Bollywood actress and Royal Challengers Bangalore brand ambassador Katrina Kaif during the Indian Premier match at the Eden Gardens in Kolkata, on Sunday. Kolkata Knight Riders registered a comfortable seven-wicket win in their IPL match against Royal Challengers. 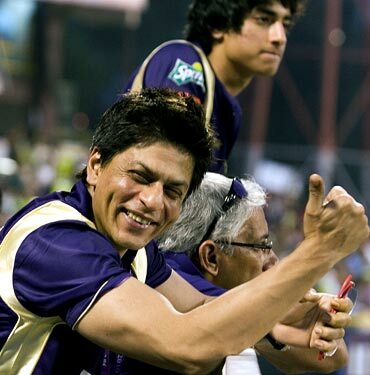 Shah Rukh was all smiles at the Eden Gardens as his team registered their second straight victory. Kolkata, who finished at the bottom last season, have now beaten the top two finishers of the second season -- champions Deccan Chargers and runners-up Royal Challengers Bangalore. Royal Challengers Bangalore players Praveen Kumar (left) and Jacques Kallis have an arm-wrestling match during the IPL Nights in Kolkata on Sunday. Bangalore's batsmen struggled to get to grips with a slow track at the Eden Gardens and were restricted 135 for seven in their 20 overs. In reply, Manoj Tiwary's quick knock of 50 from 29 balls and his 101-run opening stand in 12 overs with Brad Hodge helped Kolkata overhaul the target, losing just three wickets and four deliveries to spare. Brian Lara and his partner enjoy Manish Malhotra's fashion show at the IPL Nights after party in Kolkata. IPL commissioner Lalit Modi has urged the West Indian great to take part in the next edition of the mega event. "He [Lara] is excited of the prospect to be available for IPL 4. Told him to get into training," Modi wrote on his Twitter page. 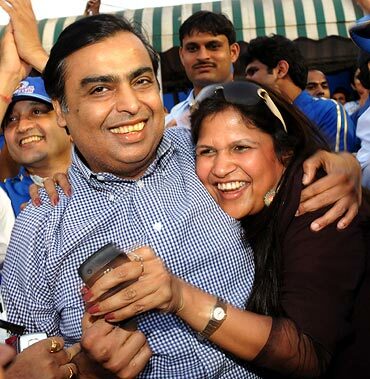 Mumbai Indians owner Mukesh Ambani celebrates during the IPL match against Rajasthan Royals at the Brabourne stadium in Mumbai, on Saturday. The Sachin Tendulkar-led Mumbai Indians got off to a winning start in the tournament after a narrow four-run victory over 2008 champions Rajasthan Royals. 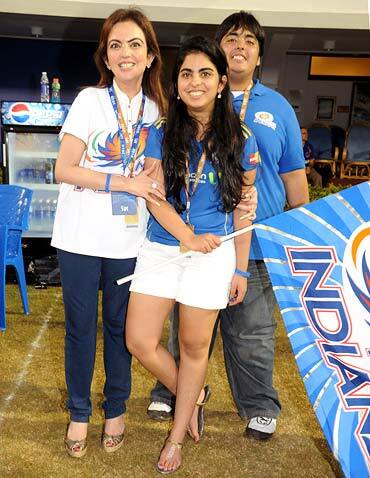 Mumbai Indians owner Mukesh Ambani's wife Nita (left) with their children Esha Ambani and Anant during the first match of IPL 3. For Mumbai, youngsters Ambati Rayudu and Saurabh Tiwary slammed maiden half-centuries to help Mumbai Indians post 212 for six in their 20 overs, their highest total in the IPL. Rajasthan Royals co-owner Shilpa Shetty with star batsman Yusuf Pathan during the match against Mumbai Indians. Yusuf gave his fans plenty to cheer about as he played one of the best innings ever seen in the IPL by hitting a 37-ball hundred. Despite registering the fastest century of the IPL, that was laced with eight huge sixes and nine boundaries, Rajasthan Royals went down to Mumbai Indians by a narrow margin of four runs. Pathan's 100 came off just 37 deliveries, bettering the record of Deccan Chargers captain Adam Gilchrist, who scored 100 in 42 balls against the same opposition in the inaugural season. 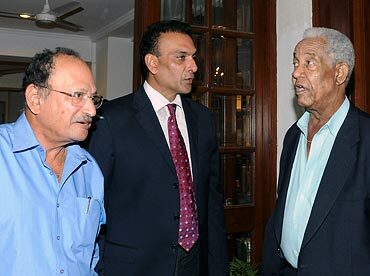 Former West Indies captain Sir Gary Sobers (right) with former India players Ajit Wadekar (left) and Ravi Shastri during the IPL match in Mumbai, on Saturday. Just a few days back, Sobers, regarded as one of the best all-rounders that the sport has seen, expressed concern over the huge sums of money that tournaments like the IPL is offering players just to compete. "Twenty20 is good... that you need and people will go and watch it. But you have to be very careful as to how far you let it go. If played in the right spirit like the Stanford T20, where the players were playing to win and there was a purse to win, but nobody was given lakhs of money to play," he had said. 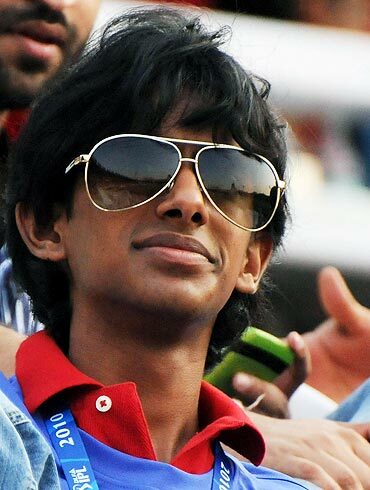 Lalit Modi's son Ruchir supports Rajasthan Royals during their opening match against Mumbai Indians on Saturday. The IPL chief said television ratings for the first few games of the IPL had exceeded all expectations. "The TV ratings for the first few games have been even beyond what I had predicted. Thanks to all the fans," he wrote on his Twitter page. Gauri Khan and Bollywood actress Priyanka Chopra attend the IPL Nights after party. Priyanka was in Kolkata to cheer for Shah Rukh-owned Kolkata Knight Riders, who have started their campaing on a high note after disappointing performances in the last two seasons. Harbhajan Singh with actress and model Vrinda Parekh at the IPL Nights after party in Mumbai on Saturday. The off-spinner hurt his knee while batting and did not take the field when Mumbai Indians bowled, but despite the handicap they posted a four-run victory over Rajasthan Royals. Bollywood actress Geeta Basra attends the IPL match between the Mumbai Indians and the Rajasthan Royals on Saturday. Some sections of the media have linked Harbhajan with Basra, so it was not surprising to see the Bollywood actress coming out to support the Mumbai Indians sporting their team jersey.